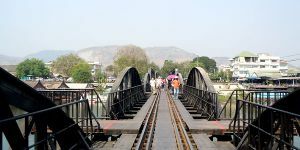 River Kwai Bridge is a must-see place in Kanchanaburi because it is the bridge coming with the history during World War II. It becomes famous because there is a book, named Bridge over River Kwai. 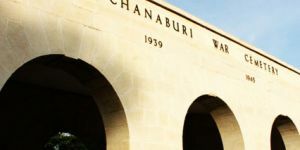 Although there is nothing much to see, but it has been the landmark of Kanchanaburi. Anyone who come to kanchanaburi always has a photo with the bridge. 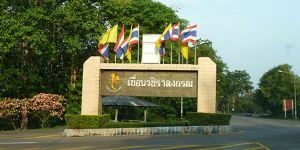 Don Rak War Cemetery is situated next to Highway number 323, not far from Kanchanburi Train Station. 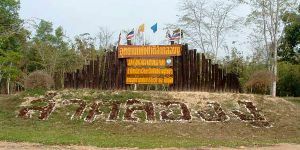 This cemetery, known by local residences as "Pha Cha Angkrit", is constructed on the area of about 7 acres, after the Second World War. The war prisons who died during the construction of the Death Railway at that time were buried here. There were in fact about 7,000 dead bodies in the cemetery. JEATH War Museum is an attraction located next to Wat Chaichumpol Chanasongkram (Wat Tai), Kanchanaburi city. It is not a large museum and it presents the story of difficult living of war prisons who was forced to build the Dealth Railway. Saiyok Noi Waterfall, known by local residence as Nam Tok Khao Pang, is one of most tourist attractions in Kanchanaburi because it is the closest waterfall from the city, only approximately 60 kilometers or just about one hour by car. Besides, this waterfall is also the last station for the train from Bangkok-Waterfall Kanchanaburi, so there are a lot of tourists visiting this waterfall on weekends and holidays. Wat Tham Sua is one of famous temples in Kanchanaburi. 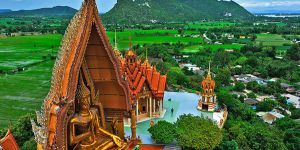 Those who are coming to visit this temple will see a beautiful Buddha image from far away because, in this temple, there is the largest Buddha Image in Kanchanaburi located. Apart from respecting to the Buddha Image, visitors also come here in order to make a respect to holy relics in Ketkaew Prasat Chedi. 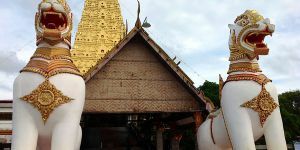 This temple is situated in Tha Muang District, where visitors can stop over before arriving in the city of Kanchanaburi. Note, Wat Tham Sua (Tiger Cave Temple) is not Tiger Temple (Wat Pa Luang Ta Bua). Wat Tham Khao Noi is located next to Wat Tham Sua. 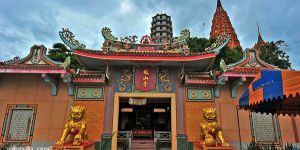 The style of this temple is really unique due to Chinese-style architecture from more than a decade, known as Mahayana style. There are only two temples in Kanchanaburi decorating with Chinese architecture (The other one is Wat Ta Wararam). With beautiful architecture, there are visitors comes to visit the temple over time. This temple is situated in Tha Muang District, where visitors can stop over before arriving in the city of Kanchanaburi. 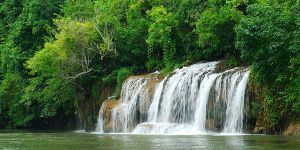 Sai Yok Yai Waterfall is a famous tourist attraction in Kanchanaburi. There are a number of both Thai and foreign tourists coming to visit this place throughout the year. This water fall flows from cliffs into Kwai Noi River, so visitors can also come to enjoy this fall by boat. 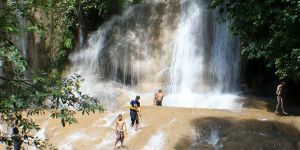 This water fall is a part of Sai Yok Water fall, which far from Kanchanaburi city about 100 kilometers. 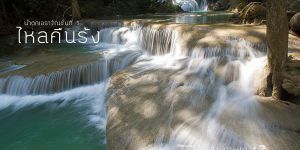 Erawan Waterfall is another interesting attraction in Kanchanaburi. The waterfall is really beautiful in the middle of the jungle. Visitors are also allowed to swim in the pool, where the atmosphere is outstanding due to natural trees and small animals surrounded. Not surprisingly, with clear water and convenience to get to the fall, Erawan Waterfall is really popular for both Thai and foreign visitors. 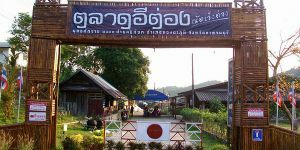 Its location is at Srisawat district, about 70 kilometers from Kanchanaburi city. 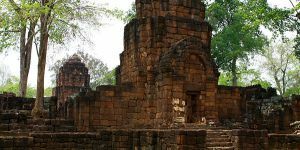 Prasat Muang Singh is an important historical park of Kanchanaburi, and Thailand. It was built for more than 800 years, so not only is this place a great attraction for visitors to see spectacular ancient city in Kanchanaburi, but it is also a great place for those who would like to learn more about old architecture from Khmer period. 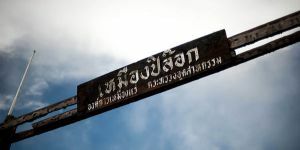 Prasat Muang Singh is located in Sai Yok District, which is not so far away from the city of Kanchanaburi. Huay Mae Khamin Waterfall is known as one of most beautiful waterfalls in Thailand. 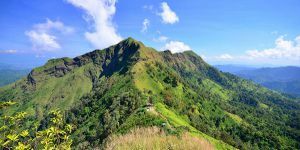 It becomes more and more popular due to beautiful scene of the water flowing from tier to tier and the natural atmosphere in the middle of the jungle. After the street has been made to the waterfall, it is currently much easier for visitors to enjoy this attraction. 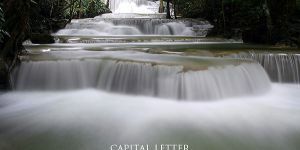 This waterfall is situated in Srisawat district, about 100 kilometers from Kanchanaburi city. 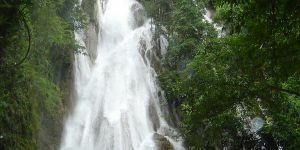 This waterfall is looked after by Srinakarin National Park. 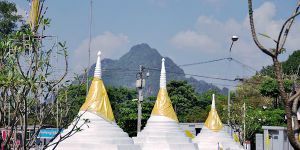 Three Pagodas Pass is a landmark to indicate the border between Thailand – Burma, in Tanowsri mountain range. 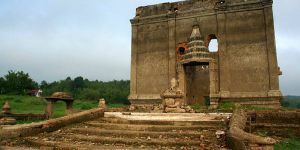 As its name indicates, there are three small pagodas located here to be the sign of the end area of the country. 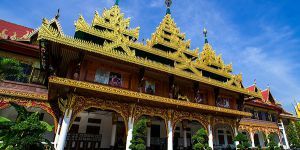 A number of visitors come here not because these three pagodas are so beautiful or something outstanding, but they actually come here for the market in this area and to visit to Burma for a day trip. This location is on the end of western Thailand, Sangklaburi, Kanchanaburi. Khao Laem National Park is a great place to take some rest with natural atmosphere, such as breathtaking and swimming at the dam. Visitors can also see fascinating sunset view at Pom Pee in the park area, which is known as the best to see sunset view in the western of Thailand. forest area is also a good place to absorb natural atmosphere while staying in Khao Laem National Park. 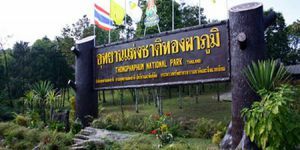 This national park is situated in Thong Pha Phum district, Kanchanaburi. Pom Pee View Point is a great spot for visitors to see beautiful scene, where many people believe that it is the most beautiful place to see sunset view on the western of Thailand. 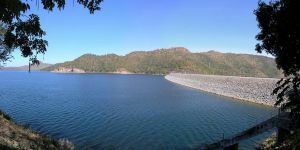 Quietness surrounded and the large water scene of Vachiralongkorn Dam with mountains on the background attracts a number of visitors to enjoy visiting over time. In the winter, visitors can also experience foggy atmosphere in the morning, which similar to some great attractions in the north of Thailand. 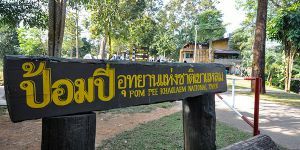 Pom Pee View Point is located within Khao Laem National Park, Thong Pha Phum district, Kanchanaburi. 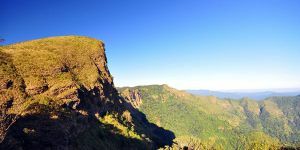 Sun Nork Wua Green Mountain (Khao Khieo Sun Nork Wua) is one of great attractions for challengers. They have to climb up for approximately 10 kilometers to get the highest point of the mountain. 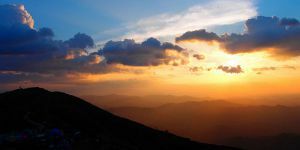 At the top of the mountain, visitors can enjoy beautiful panoramic view. Those who would like to have an adventure trip will definitely enjoy challenging his experience. 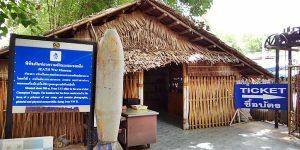 This attraction is located in the north of Khao Laem National Park. Vachiralongkorn Dam, known locally as Khao Laem Dam, is like a landmark of Thong Pha Phum district. 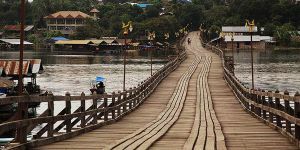 Almost all of visitors always stop over at the dam ridge to sea beautiful view of wide lake and many visitors also take photos with this fascinating view as a memorized photo for visiting Thong Pha Phum district. There is also a park in the area of the dam, where this park is decorated with trees. 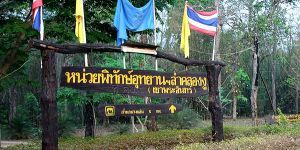 Visitors do not have to pay for the admission to Vachiralongkorn Dam. 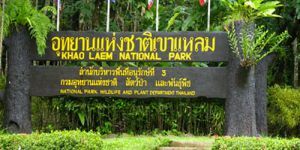 Lam Khlong Ngu National Park is a natural area, which contain fertile forest complex in the Tanaosri Mountain Range. There are caves, waterfalls, and a diversity of flowers and trees. Those who would like to take some rest in the middle of natural area will enjoy visiting attractions in this national park. However, some attractions can be seen as challenge destinations, especially caves, which suit only adventure visitors who never mind to climb a little climb and jumping into ponds during the journey. Nang Kruan Waterfall is a beautiful attraction surrounded by various kinds of trees. It is a great place for relaxation and a camping in the area natural surroundings. This waterfall has 7 levels, where water from the topmost flowing down level by level. However, not all level of the fall opens to visitors, but only the first 4 levels. 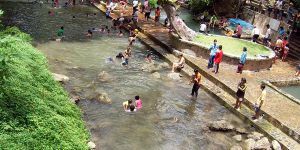 Hin Dat Hot Springs is one of most popular tourist place in Kanchanburi. There are a number of both Thai and foreign visitors, including Russians, come to enjoy this natural hot water. 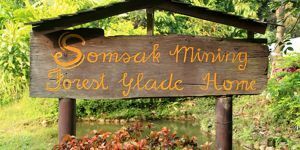 It is also seen as an attraction for being healthy, since there are minerals in this hot spring. Those who do not like to enjoy the hot spring can be relaxed by healthy activities like body massage and foot massage are also available in the area. 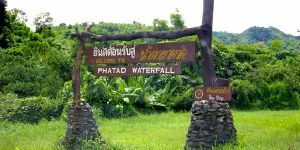 Pha Tad Waterfall is one of beautiful tourist attractions in Kanchanaburi. There are a number of visitors coming for camping and swimming in the pond under the fall. With serene and verdant surroundings, it can also be seen as a great place for recreation and discovering nature. 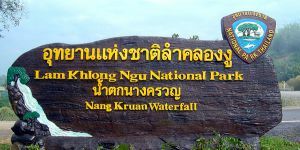 It is located within Khuean Srinagarindra National Park, approximately 140 kilometers from the city of Kanchanaburi. Pha Sawan Waterfall is a very fascinating waterfall. Although it is situated deeply in the forest, there are visitors try to get to this water fall from time to time. It can be a challenging goal for any adventure visitors who would like to go hiking (or trekking) in the forest. 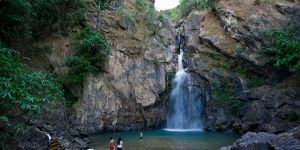 However, this waterfall can be the most difficult to get to because the track leading to the waterfall is very rough; an unmodified 4WD vehicle might not be able to go along the route easily, especially on rainy season. Srinakarin Dam not only is a hydro-electric power generation, but recently it is also seen as a landmark of Kanchanaburi province. When talking about Kanchanaburi attractions, almost Thai people automatically think about River Kwai Bridge and Srinakarin Dam. It is the third largest dam in Thailand. Visitors can go to see a very good view on this dam ridge, where visitors can feel relaxed with gently breeze there as well. Srinakarin Dam is situated at Sri Sawat district, 70 kilometers from the city of Kanchanaburi.